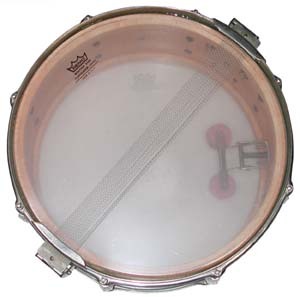 The Gene Krupa model “Radio King” snare drumA hollow cylindrical shell of any size that has a head stretched over one or both ends and is b..., manufactured by the Slingerland Drum Company, was their top-line professional model snare. It began production in the 1940s and was available for several decades in a multitude of sizes and designs, always capitalizing on the popular name of Gene Krupa. The early design of the drum featured a solid maple shellThe cylindrical body of the drum, usually made from plywood. with reinforcement rings, full flanged die-formed metal hoops, the Radio King snare strainer with a 20-strand set of snaresThe long, spiral-shaped wires that are stretched across the bottom of a snare drum. These wires..., an internal tone control, and self-aligning rods and lugsThe tension rods (or screws) that hold the hoop and drumhead onto the drum..
6 1/2-, 7-, and 8-inch depths, was available in pearl or lacquer finishes in a variety of colors, and had list prices from $54.00 to $74.50 depending on the size and finish. 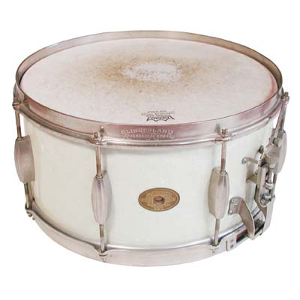 This specific drum, which features the popular white marine pearl covering, was acquired by Charlie Benton from Mrs. Krupa via Charlie Donnelly in 1975. It is a 7 x 14 size and the badge shape suggests a manufacturing date of circa 1940. It features the Radio King three-point strainer, has a 16-strand set of wire snares, and an internal tone control. 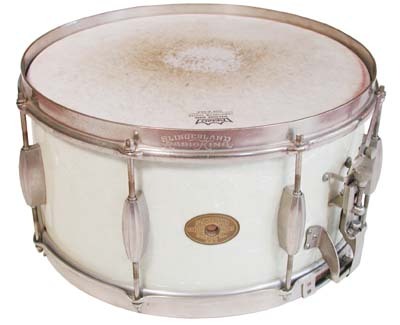 This drum also has the “streamlined” lug design and the prominent “Slingerland Radio King” trademark stamped into the nickel-plated counterhoop.